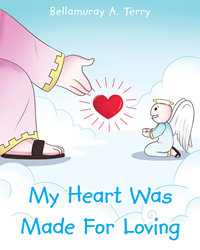 “My Heart Was Made For Loving” from Christian Faith Publishing author Bella Terry tells the inspiring story of Gabe, an angel whose uniquely huge wings bring him to a greater purpose. “My Heart Was Made For Loving”: a heartening narrative with a deep message of love and acceptance as its foundation. “My Heart Was Made For Loving” is the creation of published author, Bella Terry, founder of FaithRises.co. that spreads encouragement and God’s love to the world. Published by Christian Faith Publishing, Bella Terry’s new book is a charming journey of loving one’s self as God loved all of his creation. “My Heart Was Made For Loving” is the perfect book to teach children in accepting the important lesson of imperfections being a part of God’s plan to show his glory upon everyone and everything. The main character portrays an on-point depiction of trusting unconditionally that things will be better if one looks at the positive side of life. Being different does not make you a lesser being, but rather it can be used as an edge to be the best at anything. View a synopsis of “My Heart Was Made For Loving” on YouTube. Consumers can purchase“My Heart Was Made For Loving” at traditional brick & mortar bookstores, or online at Amazon.com, Apple iTunes store, Kobo, or Barnes and Noble. For additional information or inquiries about “My Heart Was Made For Loving”, contact the Christian Faith Publishing media department at 866-554-0919.